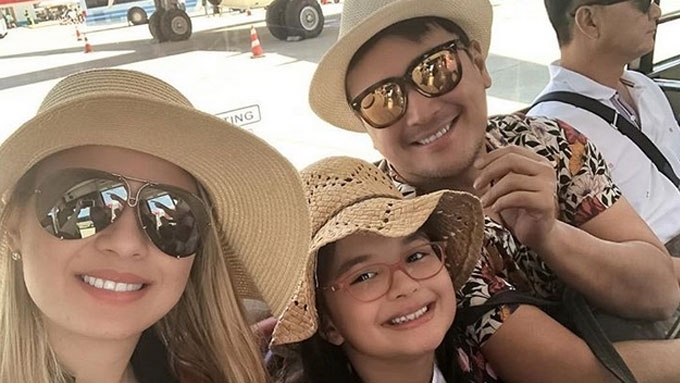 To celebrate their eight year as husband and wife, John Estrada brought his wife Priscilla Meirelles and their unica hija Anechka to Boracay. It was the latter's first time to visit the island, and looking at their family photos, she definitely had a blast. Here's a video captured at their hotel's pool side. While John was raving about the beauty of Crimson Resort and Spa, their "home for a few days," Anechka took care of the background music. She threw in, "I even put the sound on." John and Priscilla held their beach wedding in La Union on February 26, 2011. To commemorate it, John wrote, "Married for 8 years today and 11 years together ... i love you baby .... she is amazing ... i'm truly blessed to have her .... road to forever... salamat panginoon"
The Brazilian beauty queen, for her part, said, "8 years of marriage with this Filipino Cowboy by God’s grace. By this time, I am already an expert in this bull fight. Love you my conquistador. ;) #8thweddinganniversary #mrandmrsestrada"
John will resume taping for Kara Mia after her three-day break.